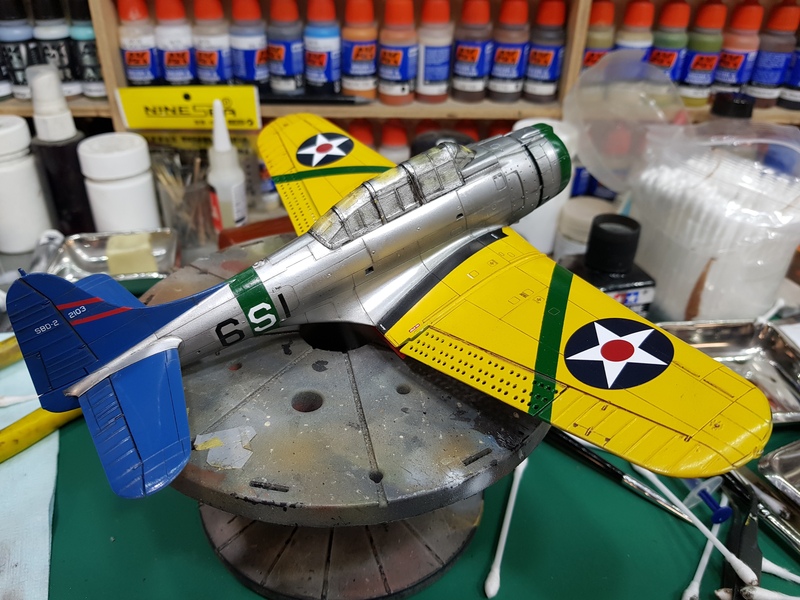 There's a modeller called David Rapasi over on ARC who seems to specialise in WWII USN types, more especially Corsairs and Dauntlesses (Dauntlii ??) 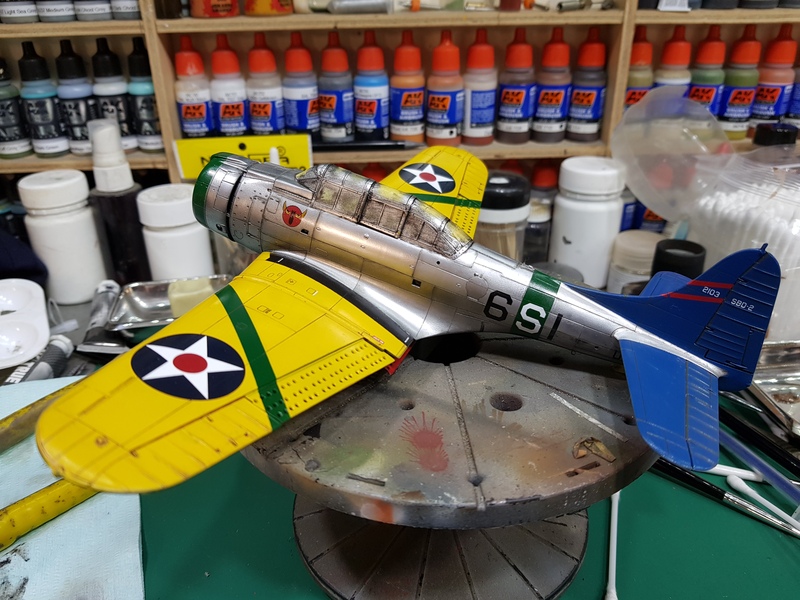 - no matter; quite a while back he posted two SBD-1's that he'd finished as (virtually) straight from the production line in the pre-war 'yellow wings' scheme, and to my eye, they looked fantastic. I don't have a dash-1 Dauntless, I have the 2005 issue of the AM SBD-2, but after a lucky find, I discovered that the USN flew the dash-2 in that scheme from around February 1941 to October when they were ordered to be painted in the blue grey/light grey patrol aircraft scheme. So this project will be a (rare) dash-2 off USS Enterprise somewhere in that brief eight month time-frame before they turned dull. This afternoon I spent an hour-and-a-half trying to match the myriad of cockpit parts with the call-outs in the instructions and I think I've got it sorted-out now, there's a definite disconnect between what the written instructions say, what the drawn instructions show and what the part numbers on the sprue indicate, strangely not mentioned in any kit review that I've read, (Hmmmm ...). A fair degree of forensic expertise is required to get it all sorted but as I don't have any, I relied on the Detail & Scale book and great deal of dumb luck !! Powder wrote: But you said on the 'New Stash Acquisitions' thread you were going to 'take a break from building for a while'... .
...to be honest, I've got so much on just now, there's really not going to be any worthwhile 'me time' this week so the week after is more likely in reality. 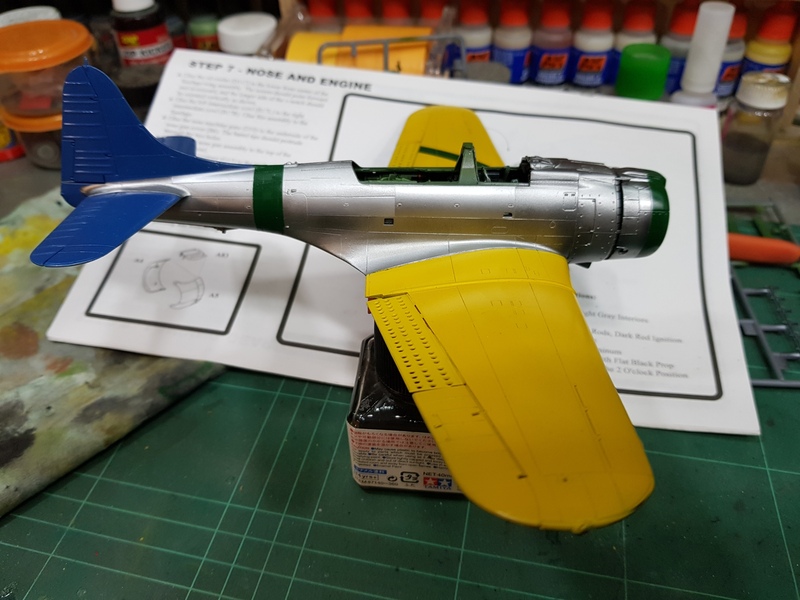 Nice project Ian, it will look awesome in the colour scheme although I do like the boring Grey Blue also. I think I made the Monogram kit about 38 years ago, thick plastic, hand painted, yeah not good. Looking forward to checking out your progress. Only one pin in the rear fuselage to anchor the two halves none in the forward part. Combine this with sub-assemblies (radio rack, shelf between the rear & front cockpits) that don't align with the interior detail nor do they have any positive locating points, etc, etc, and you'll get the picture - I'm not a coward, nor am I impatient however, when the hobby becomes a chore, I will walk away and go do something far more enjoyable... a long, deep self-delivered root canal comes to mind just now. Not to worry, found something far more enjoyable in the stash which has markings for a Kiwi machine aswell. I would love to do another AM Dauntless. It's simply a nice kit, regardless the fit and tricky details. 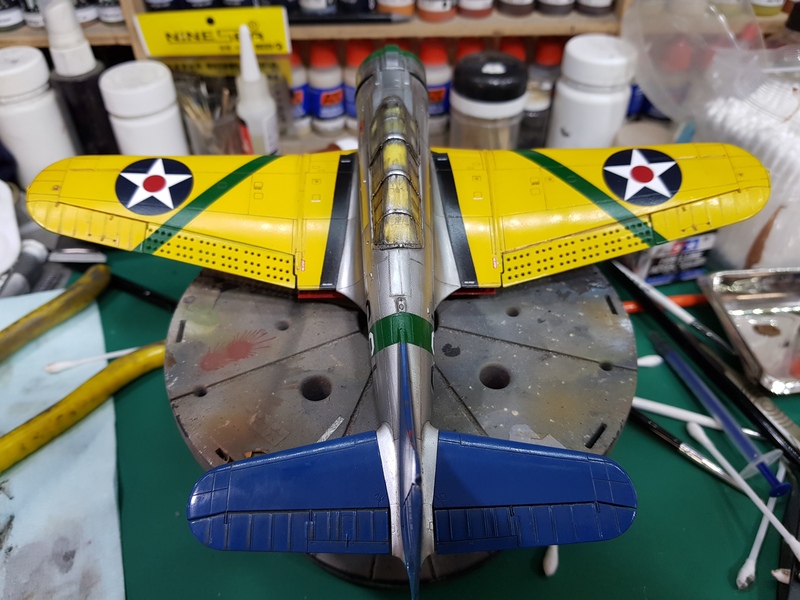 Have to extend the green stripe down the aileron, not much more to do, then it's on with the decals. I'm lost. So Gary, picked this up for you and isn't doing Midway, but is doing prewar? It looks fantastic whatever the story. Ian, all your interior work isn't wasted at all. Looks a great team effort. Yes I picked it up after Ian hit some fit issues and abandoned it, I hate waste and as I still have one languishing and in need of a repaint I decided to pick up both. 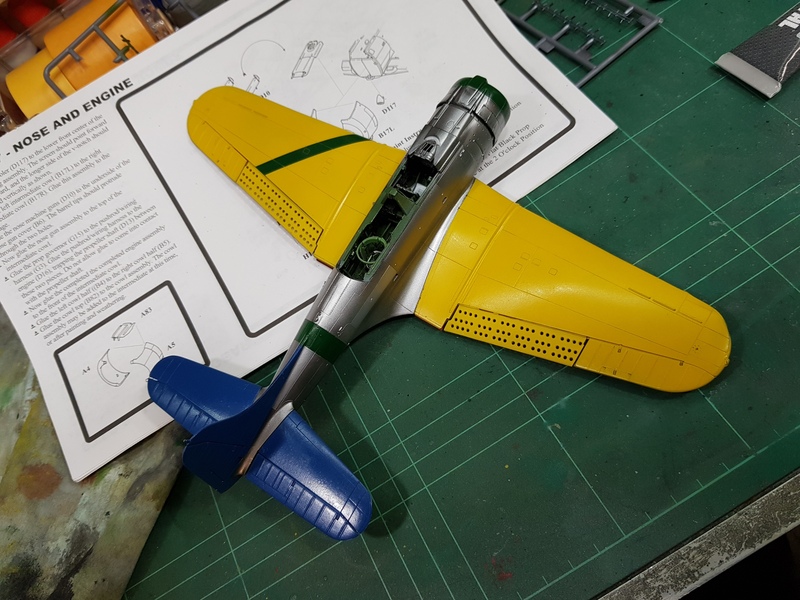 Ian was already doing the Pre-War yellow wing version and mine was already configured as such. So I have an SBD-1 and SBD-2 that are in this scheme. FYI the yellow wing on top were so that they could be spotted in the water from above should then need to ditch. The fit needed some TLC (and a small amount of hammering) but it went together fairly well, the rest was straightforward. 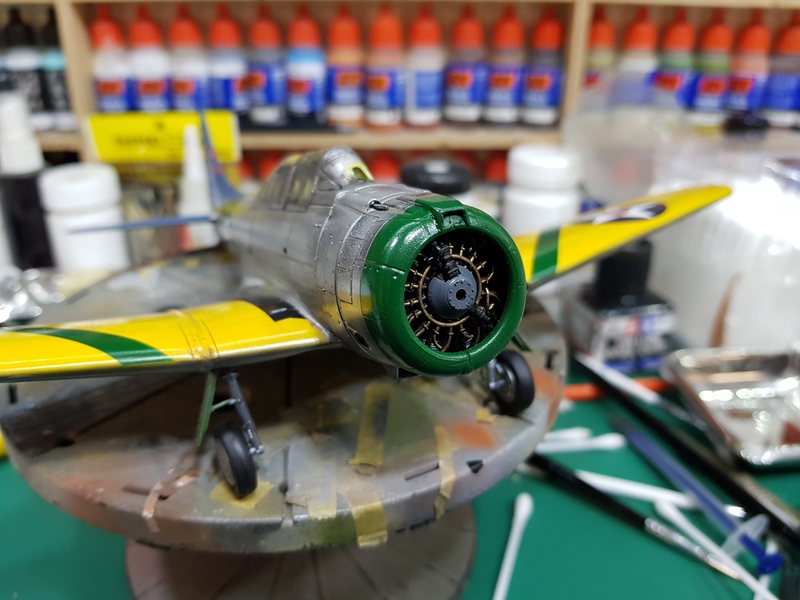 Still going on, I picked it up again over the weekend and started applying some oils and enamels for a bit of weathering. 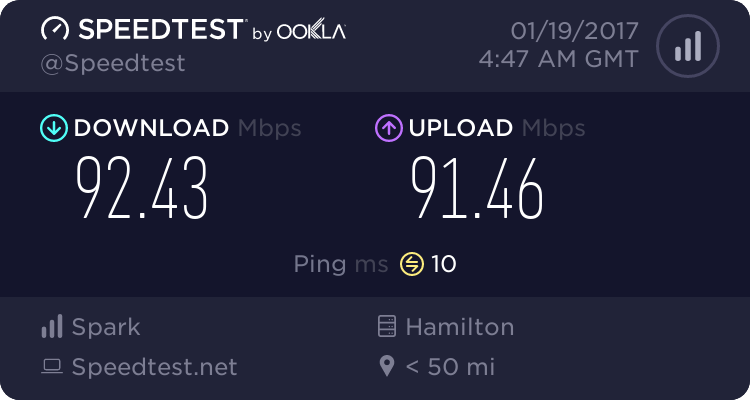 Looking very good, matey. Careful with the weathering tho' the pre-war machines were kept pretty spotless. It's not technically pre-war mate, its actually operational off a carrier in the early months after the US joined in (they used Yellow wings until some point in 1942), so it's going to be fairly dirty but not chipped to buggery. Wow that's coming along nicely! I really like the scheme, its rather pleasing to the eye. Looking very real there. These colours can't have lasted too long in to 42, not exactly blending into either the carrier or the sea heehee. That was the point, in order to see half submerged planes it gave the pilots a better chance of being found.